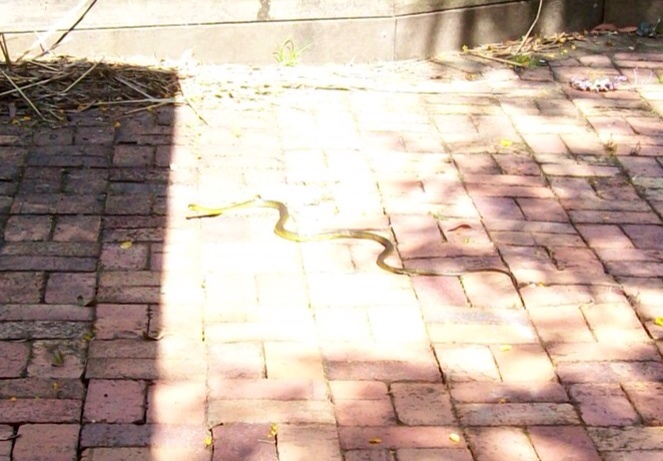 This is a very ordinary photo I took this morning of a beautiful 1.2 metre snake sunning itself near our back door. I couldn’t get close to take a good pic because it skedaddled as soon as it saw me. ~ by Garry on November 8, 2011. We are glad it is a common tree snake. I remember your telling us it is harmless. With a lady dying last week on a small holding, snakes are a frightening prospect. She was bitten while gardening. Taken to Warwick hospital where she was a nurse but did not recover.